Imagine for a moment sitting at the kitchen table, steaming coffee in hand. The sun is streaming in the windows, bacon is popping in the pan, and Rover drops the paper at your feet. A brilliant Saturday morning by any measure, but today is extra special. You work the math. You’re 33 years old today. Your target retirement date, at age 65, is 32 years from now in the year 2045. How fortuitous! Unfortunately, most 33 year olds probably aren’t in that situation. In fact, most 43, 53 year and 63 year olds are not in that enviable position either. Rather, most people expect to accumulate savings by adding to their investments over time, slowly building their nest egg through deposits and portfolio growth over many years. 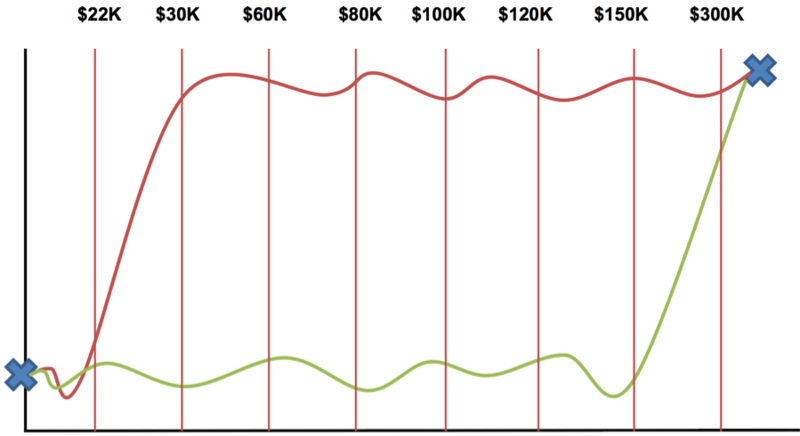 In our experience for example, a typical downtown Toronto corporate lawyer might have a savings schedule that looks something like what we see in Chart 3. In his early years, he might simply max out his registered accounts with deposits of $22k or so. As he progresses in his career his salary expands substantially, so that after 10 years or so in practice he is now able to put away $50 or $60k per year. During his final decade or so he has fewer expenses – kids are gone, cottage is paid for, etc. – and his savings really crank up to several hundred thousand per year. Chart 3. 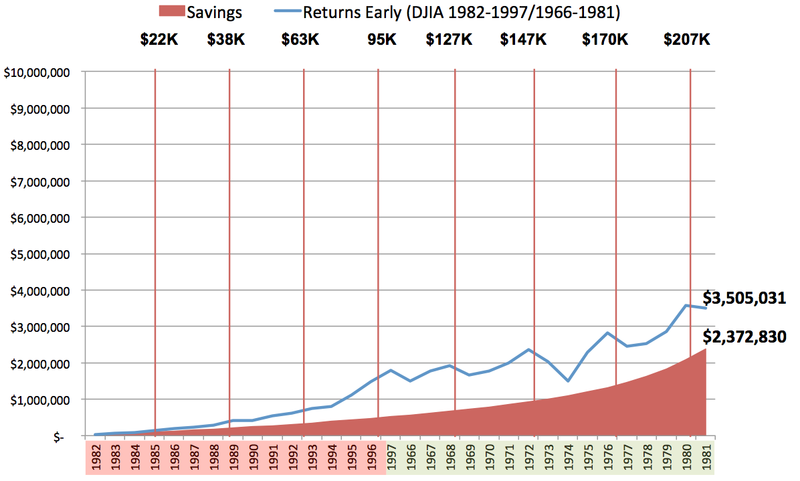 Example savings schedule from age 33 through 65. We will see in the next section that, for a professional with a typical savings trajectory where early savings are small, but amounts accelerate dramatically through middle and later working years, the sequence of portfolio returns has a profound impact on whether they are successful. Let’s take a look at Nick, a 33 year old lawyer called to the bar last year, and just found the future newspaper described above. All of his savings will go toward the investment with the best long-term average returns, meaning he will receive 8% per year on his savings. This year he will manage to put away $22 thousand in registered accounts for retirement. Each year for the next 20 years he will increase his retirement savings by just 5% even though his earnings are increasing by substantially more than that. Initially, he diverts savings to the purchase of a home, and plays some lifestyle catch-up with friends, which means a new 3 series BMW and some nice European and Caribbean vacations for he and his wife. Eventually he gets married to Pam, and they upgrade their home and buy a second car, an Audi SUV. Two kids later – Sam and Emily – and he and Pam are prioritizing college savings over retirement savings. They are now taking nice family vacations, sometimes to Disney World, sometimes in Europe. They also decide to buy a cottage nearby Pam’s sister’s family. A few years later – in the blink of an eye – the kids are actually off to college. Of course, the savings are never enough once you consider travel, rent and living expenses for university in two different towns. More savings are diverted to get the kids through school. Emily decides to go to graduate school in engineering; Pam and Nick agree it’s worth the stretch to see her launched with no debts. Twenty years have passed and, while the kids are not completely financially independent, they are on their way. Meanwhile, Nick has made great progress and is a senior partner at his firm in their family law practice area pulling down a cool half million. With the kids through school, and the house and cottage paid off, it’s time to crank up their savings. From years 21 through 25 in practice, Nick and Pam start increasing their savings rate by 10% per year. With big plans for retirement on the horizon, the couple bumps savings by 20% per year for working years 25 through 32. By the time Nick and Pam are 65, they have managed to put away a total of $2,375,000 in savings, not including any portfolio growth. So, we know that Nick and Pam are going to invest in a portfolio that delivers 8% per year, on average, over their 32 year savings horizon. What we don’t know is the sequence in which those returns materialized. In the next section we will demonstrate how this seemingly benign missing piece to the puzzle will decide Nick and Pam’s retirement fate. For the sake of illustration, let’s assume that the best index over Nick’s and Pam’s investment horizon is the Dow Jones Industrial Average. Nick and Pam confidently set aside money each month to fulfill their savings targets, and all of their money is invested in this index. Again, note that the average return to the Dow over this period is 8% per year. However, if you look closely you will see that the returns are not evenly spaced over time. 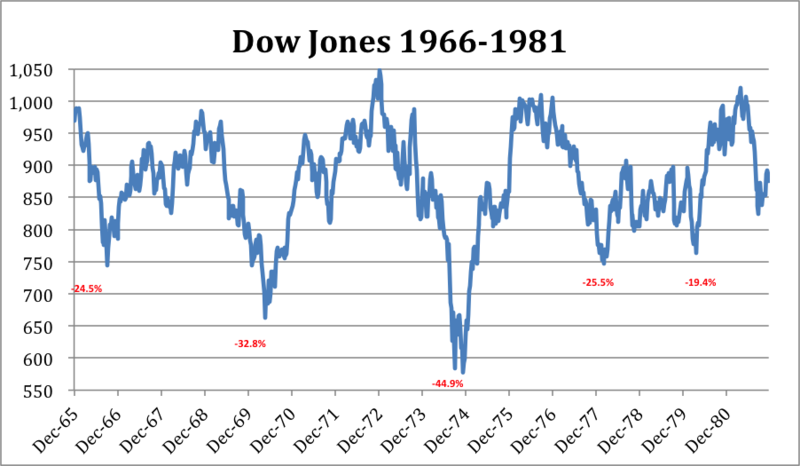 Rather, from 1966 through 1982 there are essentially no returns, as the index began the period at 1000 and ended the period at the same level. 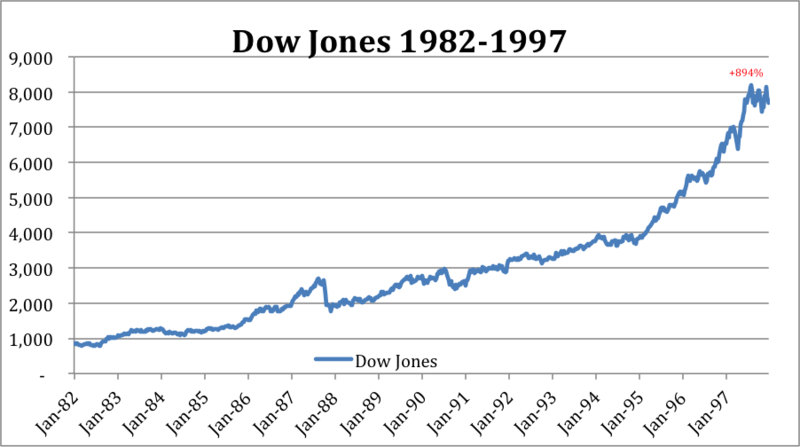 Then, from 1982 through 1987 the Dow grew at over 15% per year taking the index from 1000 to about 8000. Charts 5 and 6 zoom in to provide a better perspective on these two very different market regimes. 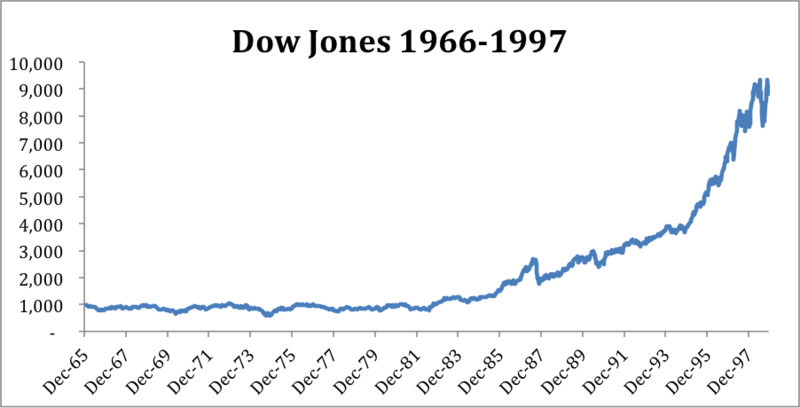 In our first instance, let’s take the straightforward example where Nick and Pam experience exactly the same returns, in exactly the same order, as the Dow index delivered over the 32 years from 1966 to 1982. That is, in the early years when Pam and Nick were setting aside small amounts, and their total nest egg was small, their portfolio experienced no growth because the market went sideways. However, in the back half of their savings horizon, when their nest egg was gaining some size and they were really cranking out the savings, the market took off like a rocket. In this example, the market growth materialized in a manner that somewhat resembles the green line in Charts 2 and 3: sideways markets early on with a late surge. Chart 7 shows the trajectory of their retirement wealth over that period, including savings and growth. Note how this this chart looks remarkably like Chart 1., which was the growth curve that most people hold in their mind’s eye when they imagine the retirement savings process. Little wonder that this is what investors expect, as many investors experienced precisely this outcome over their working lives. 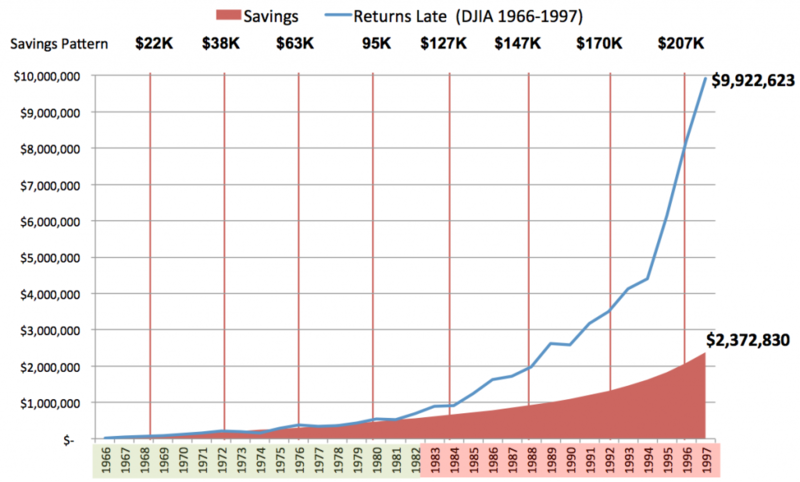 In this example, Nick and Pam have managed to turn their $2,375,000 in total savings into $9,922,000 in retirement wealth simply by investing in the Dow over their entire working lives. Now we see why Albert Einstein claimed that compound growth is the most powerful force in the universe. For our second example, we will mix things up. 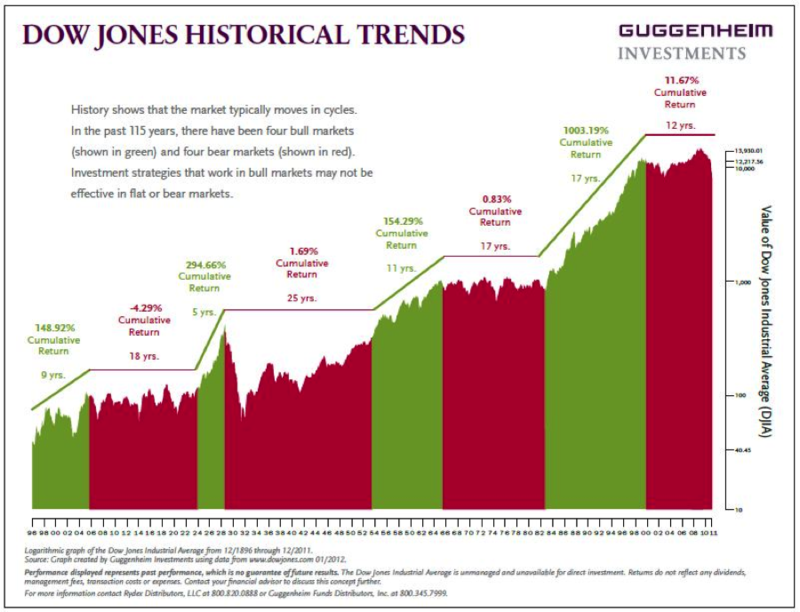 In this case, rather than experiencing the long, volatile sideways market from 1966 to 1981 first, followed by the strongly surging market from 1982 to 1997 later, we will reverse the order. In this case, imagine a situation where Nick and Pam experience the long bull market from 1982 to 1997 in the early part of their saving period when their nest egg was small and their savings were muted. Then, they experience the 16 years of poor sideways markets in the latter half of their savings period when both savings and their nest egg are much larger. Chart 8 shows Nick’s and Pam’s retirement savings trajectory under these assumptions. While the wealth trajectory in Chart 8 still moves from the lower left to the upper right over the full period, it experiences significantly more volatility along the way. More importantly, instead of ending with almost $10 million in retirement wealth at the end of their working lives, they manage to accumulate just $3.5 million. However, when we introduce cash flows into the equation, things change dramatically. We saw that, with exactly the same savings commitment, and exactly the same long-term average market returns, Nick and Pam ended up with almost $10 million in one case, and $3.5 million in the second case. So what matters most to Nick and Pam, the average return from the market, or the average growth of their portfolio? The average rate of growth of a series of cash flows is referred to as the Internal Rate of Return. It is also referred to as the dollar weighted rate of return. We refer to the average dollar weighted rate of return that a person receives on his personal portfolio as his Individual Rate of Return, and it is the only rate of return that should matter to investors who are either saving money, or withdrawing money from their portfolio over time. 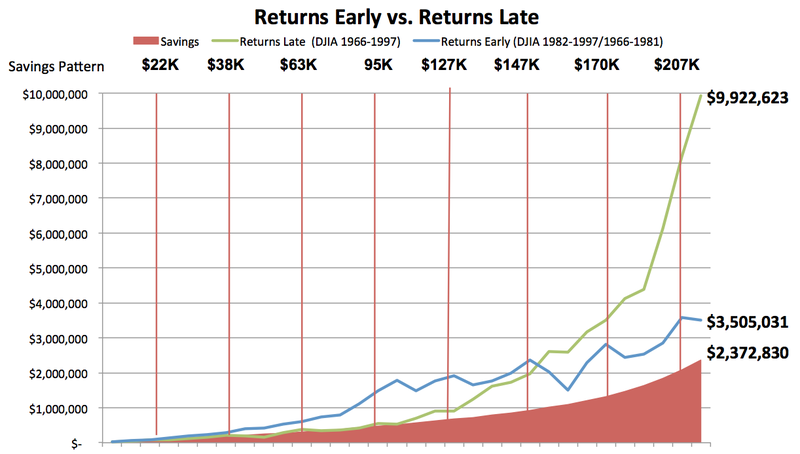 Table 1. compares the average rate of return on the Dow Jones to the Individual Rates of Return that Nick and Pam experienced in their portfolios in the two examples above. Table 1 clearly shows that an investor with the exact same savings and the exact same average market return can experience a 7% difference to actual realized portfolio growth, or Individual Rate of Return, simply due to luck. An investor who is lucky enough to experience strong market growth in the back half of their savings horizon may experience double, triple, or better growth than an investor who is unlucky enough to have most of his strong returns come in his early savings years. In the case of Nick and Pam, a weak sequence of returns resulted in a net deficit of almost $6.5 million in wealth versus the stronger sequence. Nick and Pam discovered that it is not enough to know the long-term average returns that they can expect from their investment portfolio. It is also important to account for potentially adverse sequences of returns. For savers, it is problematic to invest in a portfolio with the potential to deliver high returns in early periods followed by low returns in later periods. For investors in a net withdrawal situation, such as many endowments and retirees, sequence of returns is equally important. However, the situation is reversed, such that investors in withdrawal will be adversely affected if returns cluster later in the investment period, with lower near-term returns. The answer has profound implications for investors. Are we setting up for a decade of strong returns right now, which would prove to be a boon for recent retirees but unfortunate for young savers? Or will we experience another 5 or 10 years of sideways to set up for a long growth market a decade in our future, which would crush current retirees but would dramatically benefit today’s young savers. By actively managing portfolio risk and dynamically assembling diversified portfolios of global assets twice per month, our AAA process is engineered to minimize risks associated with sequence of returns. Instead, in tests back to 1995 the AAA approach delivered extremely stable returns regardless of market conditions. As a result, even under onerous assumptions, we believe a portfolio invested in AAA is much more likely to hit your financial targets than a traditional portfolio approach, especially given the poor prospects for stocks at this point in the market cycle. Why do you want your financial fate to rest on the flip of a coin? [*]Assuming a target 90% confidence level using historical average returns to a U.S. 60/40 portfolio of S&P500 and 10-year Treasury bonds. Also assumes income rises with inflation at 3% per year.